Unit 202 of the Israeli military has a reputation as being a top operations unit. This is judicial knowledge; or so at least according to the judgment of Judge Malka Aviv at the Jerusalem Magistrates Court in the matter of Abu Snineh. I will confess: this author has no idea what Unit 202 is, or what reputation it has gained. Perhaps this is the root of the problem. The verdict concerns events that took place in October of 2001. At the time, the Israeli military took over parts of Hebron which, according to the agreements, were under Palestinian control (Area H1). 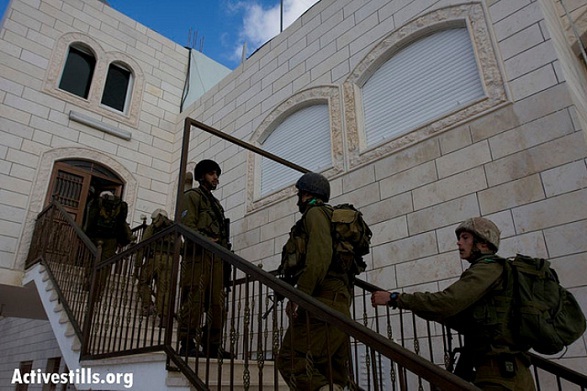 Part of this action entailed Israeli soldiers – from Unit 202, it turns out – taking over a complex of houses owned by the plaintiffs’ extended family. The soldiers arrived at the houses in the middle of the night, broke down the doors, woke up the inhabitants and ushered them out of their homes. Within ten or fifteen minutes from the time of entry into the houses, all members of the extended family, young and old, were taken out of their beds and found themselves out on the street in the cold of winter. They were able to return home only ten days later, when the soldiers vacated the homes. In the meantime, the soldiers had turned the houses into a military post. Furniture was moved in order to block windows and damage was done. The dispute between the parties related to the scope of the damage and the plaintiffs' right to compensation for it. Another dispute revolved around claims made by the family regarding theft of large sums of money and jewelry which were hidden in the house. The court rejected the plaintiffs’ claims regarding the theft for lacking credibility and went as far as finding that the plaintiffs had conspired to wrongfully accuse the Israeli soldiers in order to extort money from the Israeli public treasury. In order to base this finding, the judge analyzed the plaintiffs’ testimonies. One plaintiff did not complain about theft at all. As for the second plaintiff, the judge found his testimony to be consistent. Regarding a third plaintiff, she finds certain “gaps” in his testimony, but notes that these were not “gross and blatant gaps”. As for the other plaintiffs, the judge gives considerable weight to alleged contradictions such as naming a sum of ILS 7,500 in one place and 7,800 in another; noting the weight of the stolen gold as some 150 grams in one place and some 170 grams in another; a testimony which once mentions the money being hidden in a pair of trousers in the closet and once among the clothes in the closet; mention of the theft of a certain item in one place and omission of it in another – etc. These types of “contradictions” are almost inevitable considering how the passage of time affects memory, and the conditions under which interrogations were conducted and testimonies taken. Testimonies are always mediated– the witness speaks Arabic and each time, a different official (police officer, military police investigator or lawyer) takes down his or her testimony (fully or partially) in Hebrew. The judge also found more significant contradictions, but only in the testimonies of a minority of the witnesses and some only regarding secondary issues. These contradictions led her to the conclusion that all the plaintiffs were liars, that they had conspired together and that those of them whose testimonies were more consistent were simply more careful in the perpetration of the lie. While the Palestinian witnesses are depicted as liars, the Israeli soldiers are found to be entirely trustworthy. I was fortunate enough to review the file: the testimonies of the Israeli soldiers could be torn to pieces – so many are the substantial contradictions in them. One soldier says no use was made of closets to block windows, whereas the others testify that such use was indeed made. Some testify that they used the refrigerator to block the windows (one of them explains: “we had nothing to put in the fridge, we got combat rations”). Yet another testifies that there was an order not to touch the refrigerator. There are also contradictions regarding use of the toilet, showers and television. One soldier says that the inhabitants of the home were not allowed to come in to take items at any point during the ten days. Another says that they were. The soldiers seem to disagree even about the time of the takeover. One claims, in contrast with his comrades (and the rest of the evidence), that the takeover did not occur in the middle of the night but rather in the afternoon. Some of the soldiers, including the platoon commander, who was a key witness, did not even report to give testimony. One of the court’s reasons for rejecting the claim regarding the theft was that it was impossible for there to be a theft on such a scale in an intense situation where a small group of soldiers are located together in isolation for ten days without other soldiers knowing about it. The court seems to be supposing that if the soldiers who did not steal had known about the theft, they would have reported it and even testified about it before the court. Or, in other words: they would have snitched. Yet, the opposite claim could have been made just as easily, that is that the dynamics of a small group of soldiers involved in intense action in isolation from others would have prevented snitching. However, there is no need for speculation regarding the dynamics. One of the soldiers testified that during a search of the house, he found a bag with gold jewelry. He reported this to his commander and returned the bag to where he had found it (the verdict erroneously notes, in contrast with the protocol, that the soldier gave the jewelry to his commander). The soldier testified that he had not kept this secret and that he thought the other soldiers knew about it. Yet, every other soldier brought in to testify denied any knowledge of the incident. Either the soldiers lied, or the judge’s presumption that there are no secrets in close company crumbles. The second issue addressed by the court was property damage. The court did find that damage had been caused, but that this was a result of justified actions by the soldiers – searching the house and turning it into a military post by using the furniture. “This damage” writes the court, “as well as the inconvenience caused by the mere evacuation of the house – and I have no doubt that it involves significant inconvenience and distress – are all a necessary evil accompanying the military action”. The judge distinguishes between this type of damage and damage that is not justified by military necessity: "It should be emphasized that should I have seen in the photos any evidence of destruction for its own sake, as occurred, alas, in other places, I would not have hesitated to determine so and address such destruction, as I shall regarding the Plaintiffs' claims of theft." The judge does not even go into the question of whether it is justified for an organized, equipped military such as the Israeli military to require closets, sofas, a refrigerator and other civilian property in order to protect its soldiers. The expulsion of an entire family from its home in the middle of the night with only a few minutes to get organized is perceived as natural and self-evident. Indeed, if more time had been given to the family to organize, they would have been able to gather all their money and jewelry and the entire dispute regarding the theft would have been prevented in the first place. The judge could have concluded her verdict regarding the issue of damages with a finding that the damages were entirely reasonable in the context of military needs. The significance of this would have been that the soldiers did not break the law in destroying the property. Under classic tort laws, this is sufficient for the state not to be obliged to pay damages. Indeed, it is inappropriate that a civilian Palestinian family would bear the war expenses of the Israeli military. There are also two legal doctrines which oblige compensation for damages incurred in a justified action which arbitrarily injures an innocent victim. However, these doctrines are not yet systematically applied in Israeli law. The court chose not to base its verdict on lack of negligence on the part of the state, but rather on the immunity it is granted for actions which constitute a “wartime action”. Traditional Israeli case law restricted the state’s immunity for “wartime actions” to payment of compensation for damages stemming from actual combative actions – artillery fire exchanges for example. The case law has emphasized that the action which causes the damage is to be examined and not the war which is taking place in the background: even during a comprehensive war, damages caused by negligent management of logistic deployment in the home front are not exempt from compensation, while, at the same time, there is no duty to compensate wartime actions even if carried out during a time of peace. The primary test for ascertaining which military actions constitute a wartime action and which do not is the risk under which the forces that committed the action operated. It was developed in the case law regarding the first intifada. In the Abu Snineh case, the judge leaves all these diagnostics behind. She places the main emphasis on the war and not on the action. She defines the “war on terror” as a war for all intents and purposes and provides an emotive description of the “war” which was at the background of the events: “the period in which the events which are the subject of this proceeding occurred, was a period rife with terror in Israel. Hundreds of innocent and guiltless people were killed in murderous terrorist attacks. The State was in a period of war that was worse than any other war, as it was happening at the heart of the home front – directed at babies, the elderly, children and youth and [included] harm to all levels of the non-fighting population.” In sharp contrast to past case law, the judge derives the warlike character of the action from the state of war (as defined by her): “In such a state of affairs, actions performed by the security forces, in order to stop the raging wave of terrorism, were actions carried out as part of a true war”. As for the test of risk – in this case, it was difficult to claim that the soldiers were at any particular risk, certainly not one characteristic of war. There was no proof of shots fired by even light weapons toward the house-post on any of the ten days in which the soldiers remained in it, nor assaults using cold weapons or stones; not to mention the fact that there was no battle, no artillery fire exchanges. In this matter, the court concludes that potential risk suffices and not necessarily one involving the action itself: sufficient that the action is taken in order to protect the civilian population, which is the one under risk, for the test of risk to apply and the action to come under the definition of a wartime action. Judge Aviv concludes her verdict with a reprimand directed at HaMoked: Center for the Defence of the Individual, which assisted in filing the suit: “it would have been appropriate for this organization, to better examine communications addressed to it, so that it does not find itself in embarrassing situations such as this, and so that it does not turn into an organization that encourages futile complaints and deceitful attempts”. This reprimand seems out of place in view of the deep gaps which traverse the length and breadth of the verdict, and particularly in light of the haste the court made to translate its lack of faith in the plaintiffs’ version into a factual assertion that they had conspired together. The author is a lawyer and an activist for human and other animals' rights. Formerly on staff at HaMoked: Center for the Defence of the Individual. CC 8811/04 (Jer.) Abu Snineh. v. State of Israel (2009), judgment of November 9, 2009.